Our range of Dust Collectors is used as the scrubbing agent to safely handle explosive powders such as aluminum dust. We are reckoned as a prominent Portable Dust Collector Manufacturer and supplier based in India. Our Portable Dust Collector is a twin process cleaner used for vacuum cleaning as well as high pressure jet blower and very much suitable for many industrial applications. Portable Dust Collector is extensively used to collect dust and clean machines and systems. 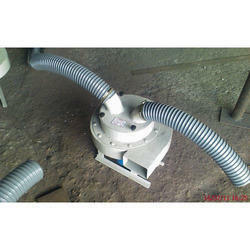 Our Portable Dust Collector is handy and efficient dust collector used for industrial cleaning. We provide Portable Dust Collector at industry leading rates. Industrial Dust Collectors:- We offer industrial dust collectors with filtration systems used in cement industries. These use liquid as the scrubbing agent that helps to safely handle explosive powders such as aluminum dust. Dust Collection Systems:- We offer a range of dust collection systems or blowers that has been designed to handle heavy dust loads. Our dust collection system comprises of a blower, dust filter, a filter-cleaning system, and a dust receptacle or dust removal system.